In anticipation of the season of hibernation, here are three new foodie subscription services to ensure that you never have to leave the house when the temperatures dip. The fall equinox may have been a few weeks ago but it feels like it officially became autumn in the northeast this week: temperatures dropped into the 40s last night. In New York City, we’re finally retiring our in-window air conditioners, clearing out the pantry to make room for root vegetables and cleaning our ovens in preparation for a months-long roast-a-thon. We’re also getting our DVRs ready for a serious workout. In anticipation of the season of hibernation, here are three new subscription services to ensure that you never have to leave the house when the temperatures dip. 1. The FareTrade. Rockstar chefs like Matthew Gaudet and Cathal Armstrong (both Food & Wine Best New Chefs, from the class of 2013 and 2006, respectively) curate monthly packages of their favorite artisanal food products, along with recipes for how to use them. 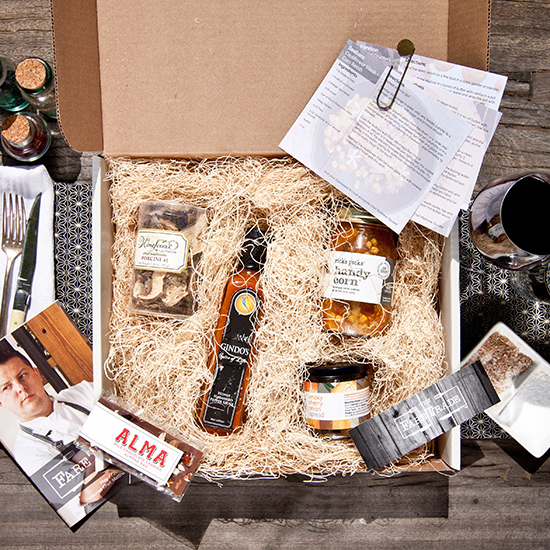 This month’s box features items like curry pumpkin pesto sauce and wild mayhaw jelly (tastes like a tangy apple) selected by Food & Wine Best New Chef 2012 Jenn Louis. 2. Farmbox Direct. Launching nationwide this month, Farmbox Direct delivers totally organic produce in three different size box options. Optional add-ons like organic milk, eggs, bread and cheese are available, as well as boxes specifically designed for juicing. The produce choices work like a community supported agriculture (CSA): the season, the weather and what the farmers are growing dictate what’s in the box each week. 3. The Tasteful Pantry. The careful label readers at the Tasteful Pantry guarantee that the snacks in their monthly treat boxes conform to whatever dietary restrictions subscribers indicate: gluten-free, dairy-free, vegan, soy-free, nut-free or low carb. Some of our favorite snack options: addictive Dang toasted coconut chips (vegan! Soy-free! Nut-free! Non-GMO! ), dark chocolate Sun Cups (watch out, Reese’s; these things are crazy good and have no gluten, soy or nuts) and Plentils lentil chips (just five ingredients, but no dairy, soy or nuts).